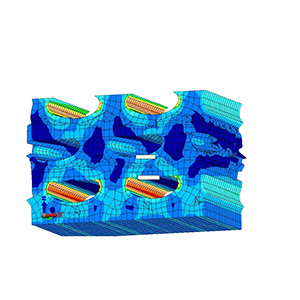 FEA-Solutions (UK) Ltd - Finite Element Analysis For Your Product Design | 201: Heat Exchanger Core Stress analysis of diffusion bonded heat exchanger core subjected to pressure and thermal expansion. Report included extensive stress linearisation required to confirm compliance with pressure vessel code. Image shows a very small cut-out of the model. Stress analysis of diffusion bonded heat exchanger core subjected to pressure and thermal expansion. Report included extensive stress linearisation required to confirm compliance with pressure vessel code. Image shows a very small cut-out of the model.